Want a simple method for migrating mail to SmartCloud? Maybe you are interested in moving to a Service-Only configuration, but were told you couldn’t migrate the data? Maybe you already completed a migration in a hybrid environment only to find one mailbox that was missed and needs to be migrated after the migration specialist is gone? This process is embarrassingly simple and could make migration tools obsolete, at least for smaller environments. This puts self-service migrations in the hands of the end user. It could eliminate many billable hours transferring mail for Certified Data Transfer Managers (DTM) like myself. But I believe in things like Open Source software and Sharing Knowledge for the greater good. Use Archiving. It’s that simple. Adjust the ACLs of the mail files as necessary. Create local replicas of the old mail file and the new mail file. 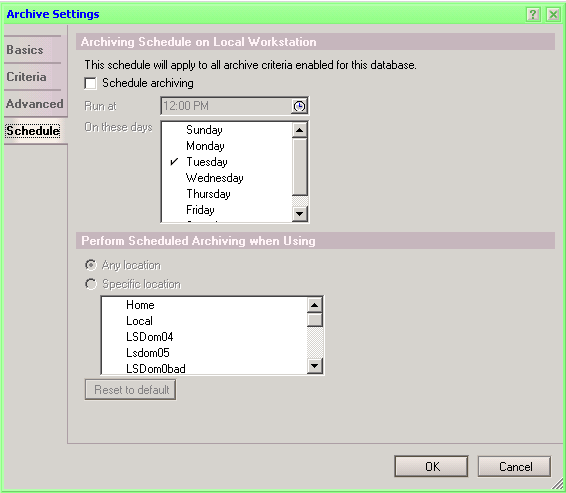 Setup Archive settings in the old mail file to archive into the local new mail file. 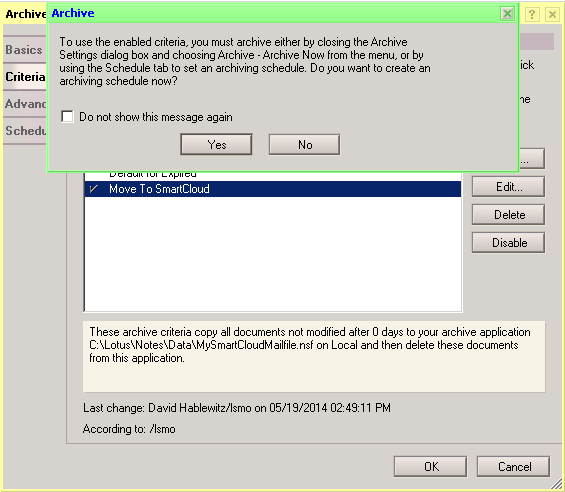 Replicate the new mail file back to SmartCloud. Review the old mail file to ensure all documents were archived. 1. If you are going to switch to a Service-only environment, you will be getting a new Notes ID. Make sure it has access to your old mail file. This step may need to be done by the system administrator. 2. Open your old mail. 3. Create a local replica of it. It Must not be encrypted. If you already have a local replica that is encrypted, you will need to make a new one. 4. Uncheck the box on the replicator page to replicate it. This will keep it from replicating the deletions back to the server after you archive. 5. 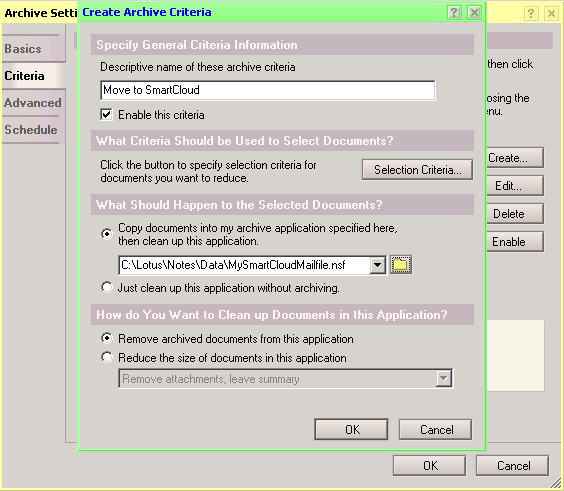 Repeat steps 2,3, & 4 for your new mail file in SmartCloud. 6. Open the local replica of your old mail file. 8. Click on the Criteria tab. Disable any criteria that have a check mark indicating they are enabled. 9. Click the Create… button. 10. Enter a name for this criteria, something like “Move to SmartCloud”. 11. Check the box to Enable this Criteria. 10. Click the Selection Criteria button. 12. Leave the setting to “not modified in more than”, and change the period to 0 days. 13. Click on OK to all of the boxes. If the following dialog pops up, click yes. 14. The Scheduling settings will be displayed. Click OK without enabling the schedule. 15. You are now ready to perform the archiving. 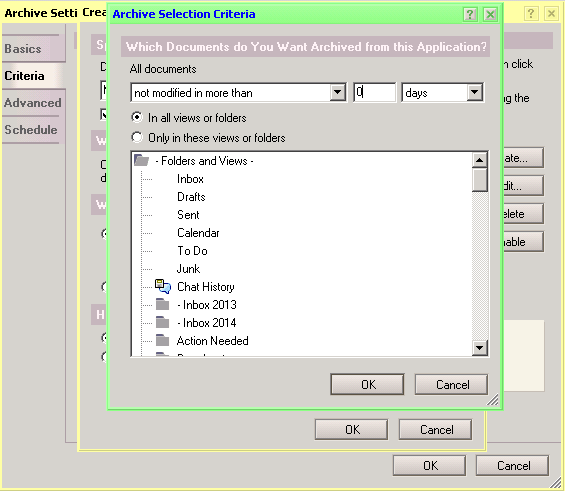 From the inbox of your old mail file, Pull down Actions – Archive – Archive Now. 16. When it is complete, you can check the document count in the database properties. It should be close to zero.Check the All documents view and in your calendar check the Lists – Calendar Entries view for documents that didn’t get brought over. It may be easiest to just re-create calendar entries. 17. Review the folders and calendar in the new mail file. When you are satisfied with the documents in the new mail file, go back to the replicator page and enable it so it can replicate to the SmartCloud server. That is the whole process in a nutshell. There are some potential obstacles, like connection speed to the Internet, mail file size and Private folders. Also, you may also prefer to have someone with experience to turn on and configure your SmartCloud environment and address some other architectural details, but the act of moving your data can be incredibly simple. I have helped companies use this method very successfully. If you want help with the process, contact me at Divergent Solutions. See the full list of tips HERE. 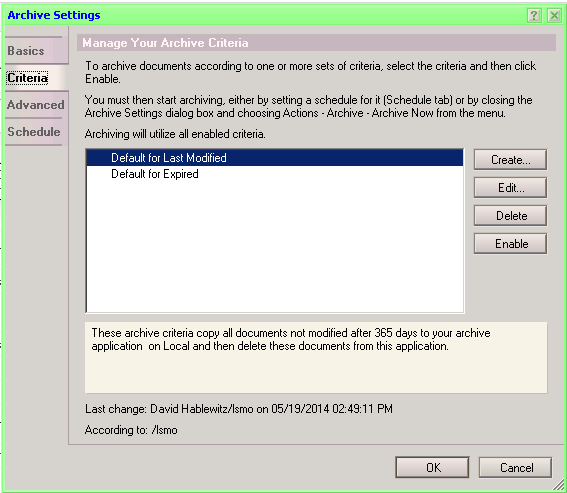 Posted on December 29, 2014, in Quick Tip, SmartCloud and tagged archiving, migration, quick tip, tips. Bookmark the permalink. 2 Comments. Stephan, I haven’t tested it to know, but I would expect it to work. In a hybrid environment you will have the same ID file and therefore the same private key to decrypt the message, so that should work fine in the same way archiving any encrypted message works. Are you getting the failure during the archiving or when replicating it up to the SmartCloud server? In a Service-only environment, you get a new ID file and therefore a different private key, so that would certainly be true. This is the same as when you migrate to any other platform.